Sometime in August I started developing quinoa gratin recipes and stopped with quinoa salads, so I didn't have extra beans for green salad, what, I know, how hard is it to whisk up some vinaigrette and toss some beans in. It was just easier to eat a little more chicken, okay, and I liked my salads fine like that. So my summer green salad formula is officially avocado, romaine (because romaine keeps the best and is therefore the easiest and also the crunchiest), chicken, and fruit. And now my fall green salad formula is avocado, kale (which is also easy and crunchy, and hearty for fall), turkey meatballs, and fruit. Stem, wash, and slice the kale and spin it dry in a salad spinner. Whisk the vinegar with the oil in a large bowl. Add the kale to the vinaigrette, rubbing the vinaigrette into the kale. You will have a lot of dressed kale, grab a handful to eat now and put a bunch of handfuls into takealong boxes in the fridge. The freshest kale will be super crunchy and hearty, kale at the end of the week will be pleasingly broken down but still crunchy and good. 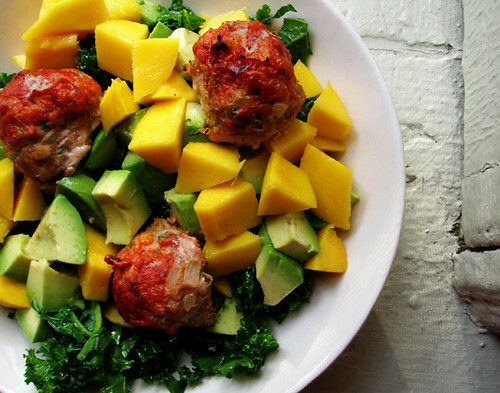 Per salad, put down a base of kale on your plate, peel, seed, and dice an avocado and a mango—my current favorite fruit— and pile on the avocado, mango, and turkey meatballs. So obviously, it doesn't have to be turkey meatballs for protein. It can be chicken, if you're still rockin' the chicken, it can be salmon, it can be tuna, it can be sardines. And it doesn't have to be mango for fruit—like I said, tomato is very good—but something that stands up to the kale, which both mango and tomato do.